The asbestos/artificial mineral fibre analysis is carried out according to accredited procedures in our own laboratory, the analysis for phenol index, PAH according to EPA in cooperation with partner laboratories. „"in the recent past a number of indications that tar-containing roofing paper waste is also due for disposal, which is additionally contaminated with carcinogenic fibres. Asbestos fibres are reported in the majority of cases, but artificial mineral fibres (of old design) may also be present as pollutants." "to provide proof of fibre freedom for each batch of roofing felt waste delivered to a treatment plant. The suitable test method (based on the detection limit) is the method of the Institut für Arbeitsschutz der Deutschen Gesetzlichen Unfallversicherung - Arbeitsmappe Messung von Gefahrstoffen, Kennzahl 7487 (the so-called "BIA-Method")." (Institute for Occupational Safety and Health of the German Statutory Accident Insurance - Workbook Measurement of Hazardous Substances)." 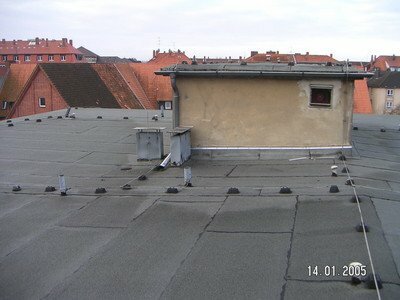 In fact, roofing felt can have high asbestos and/or mineral fibre concentrations, partly in the 2-digit mass % range. 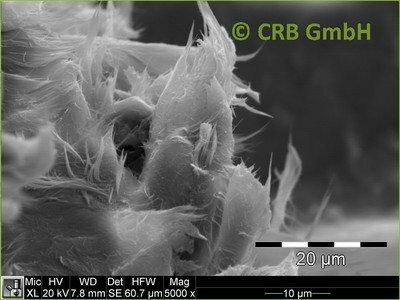 The use of these highly contaminated materials in a sensitive, quantitative test procedure for low asbestos fibre concentrations ('BIA 7487') is prohibited for reasons of occupational health and safety during sample preparation in the laboratory as well as the no longer given evaluability of filter preparations of such a material that are much too highly occupied by the scanning electron microscope. Preliminary examination of the material after hot ashing at 450° as a strewing preparation according to guideline VDI 3866, sheet 5:2017-06 with a detection sensitivity of 0.1 mass % asbestos/artificial mineral fibres (see note*). Only in the case of a negative result, a follow-up examination according to BIA Method 7487 with a detection sensitivity of 0.008 mass % asbestos/artificial mineral fibres is carried out (see Note*). *It should be noted that both in an investigation according to VDI 3866 and BIA 7487 asbestos / artificial mineral fibres are enriched in the ash by a factor of 10-30 through hot ashing and can therefore be detected in any case.